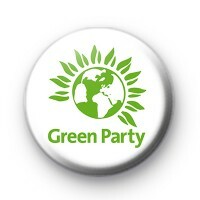 Green Party Logo Political Badge led by Caroline Lucas and Jonathan Bartley. 2017 British General Election button badge. Standard 25mm badge.